Halloween is right around the corner, and while this is one of the most exciting holidays for people, there are many safety and health risks to be aware of for your pet. At Sun Valley Animal Center, we want your four-legged friends to be safe and healthy year-round, but especially during the holidays when there’s a lot going on. Today, we will offer six Halloween safety tips for you to consider, which can help you keep your precious furbabies safe and sound during this spooky holiday. If you’re heading out of town for a frightful Halloween adventure or are hosting a Halloween party, we offer dog boarding services at our state-of-the-art Pet Lodge and Ranch for just these occasions. Contact our animal hospital and pet lodge to learn more! In the meantime, here are six Halloween safety tips. While most pet parents are aware of the dangers chocolate poses, they may not be aware of the hazards of artificial sweeteners, which are also highly toxic to dogs. Chocolate, which contains theobromine, and artificial sweeteners found in sugar-free candies, which contain xylitol, can cause your dog a number of symptoms. These may include nausea, vomiting, diarrhea, or more severe symptoms that could cause long-term damage. Plus, the wrappers pose another threat, as do popsicle sticks found in candy apples. It is of the utmost importance to keep all candy out of paw’s reach. It’s a lot of fun to decorate your home for Halloween, but keep in mind that your dog may see these more as toys for them to play with. Garland, lights, and sharp decorations all pose threats to your pet that could cause them trauma, which could then lead to an unexpected visit to the veterinarian. Keep decorations up off of the ground so they can’t chew on them or become tangled in them. Dogs are naturally drawn to bright, flickering lights, especially in darkened rooms, which makes a burning candle quite enticing to a dog’s curious nature. Candles can easily be knocked over by sniffing nose, a wagging tail, or swiping paws, so avoid leaving candles burning when there’s no one in the room to attend to them. Keep in mind that burning candles in pumpkins will also attract your curious canine, so it’s best to keep them away from these decorations. 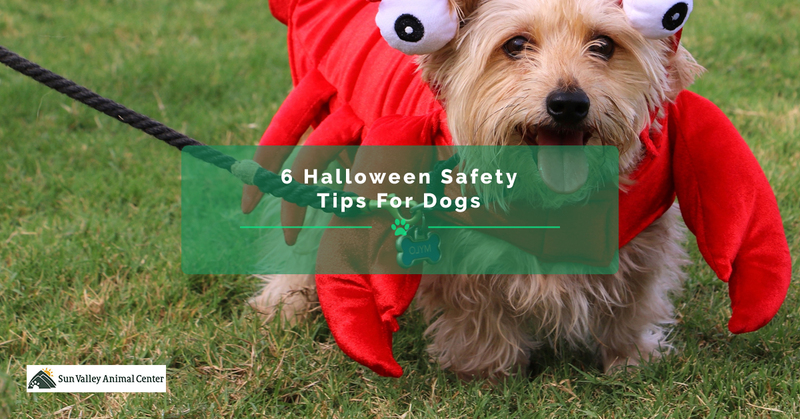 It’s so much fun getting trick-or-treaters at your door on Halloween, but this can be quite stressful for your dog, especially for anxious or timid dogs. Rather than trying to wrangle your pup every time the doorbell rings, create a safe and cozy place for them to hang out during trick-or-treat hours. If you’re worried that your dog will still hear the doorbell and bark or become anxious, it might be better to sit on your porch in costume to hand out candy as the kiddos come up to the door. Dog costumes have come a long way since the days of dressing them up in a simple bow tie, hat, or tutu. If you’re a fan of dressing up your dog in costume for Halloween, choose their costumes wisely: while your precious pup looks extremely adorable in their Yoda costume, keep in mind that those Yoda ears could become chew toys. What’s more, costumes that feature more elaborate features could become a choking hazard if swallowed. Additionally, dogs don’t always like wearing costumes that can be uncomfortable and limit their movements. Be aware of this when choosing their costume, or opt instead for an adorable Halloween-themed bandana that is both comfortable and stylish. If you plan to host a Halloween party, you might consider boarding your dog at our comfortable pet lodge and ranch for the night. Halloween parties can cause your dog a lot of anxiety, no matter how much they love people. There are many aspects of Halloween parties that could put your dog in harm’s way, such as a hefty amount of snacks and candy, alcoholic beverages, costumes, and loud noises. If you would like to learn more about our Top Rated Local® dog boarding at Sun Valley Animal Center, contact us today! We proudly offer dog boarding services to pet parents in and around Boise, Salt Lake City, Spokane, and Billings. Reserve a dog condo for your precious pup today!